For women and men interested in a multi-tasking treatment that promises smooth and glowing skin, HydraFacial MD is an excellent option. This non-invasive device can address a variety of skin concerns in a single session without any pain or downtime. With all of these benefits, many patients believe that HydraFacial is the ideal cosmetic procedure. So, is it really that much better than other treatments? Here are the advantages of HydraFacial compared to microdermabrasion, chemical peels, microneedling, and IPL. HydraFacial gently cleanses, exfoliates, extracts, and rejuvenates skin with nourishing serums. It is safe and effective for all skin types and can treat fine lines, wrinkles, dark spots, hyperpigmentation, clogged pores, mild acne, and oily skin. HydraFacial uses oxygen and vitamin-rich water and its vortex technology to rid the skin of impurities and stimulate collagen and elastin. More specifically, it starts by exfoliating dead skin cells with a dermaplaning tool that many patients describe as a vibrating sensation. Then, HydraFacial dislodges build-up from pores with its vortex-extraction nozzle. Finally, the vortex-infusion attachment delivers antioxidant serums, peptides, and hyaluronic that penetrate deep into the dermis. Depending on patient needs and goals, chemical peels, LED light therapy, and microcurrent may be used in conjunction with HydraFacial. Microdermabrasion removes oil, dirt, bacteria, and residue from the skin’s surface and provides tone and texture improvements. It’s a two step-process of manual exfoliation with a coarse or diamond tip wand and application of serums. However, for patients with rosacea, acne, and broken blood vessels, this abrasive sanding technique can cause inflammation and worsening of symptoms. Aesthetic experts agree that HydraFacial is a more gentle and effective treatment compared to microdermabrasion. 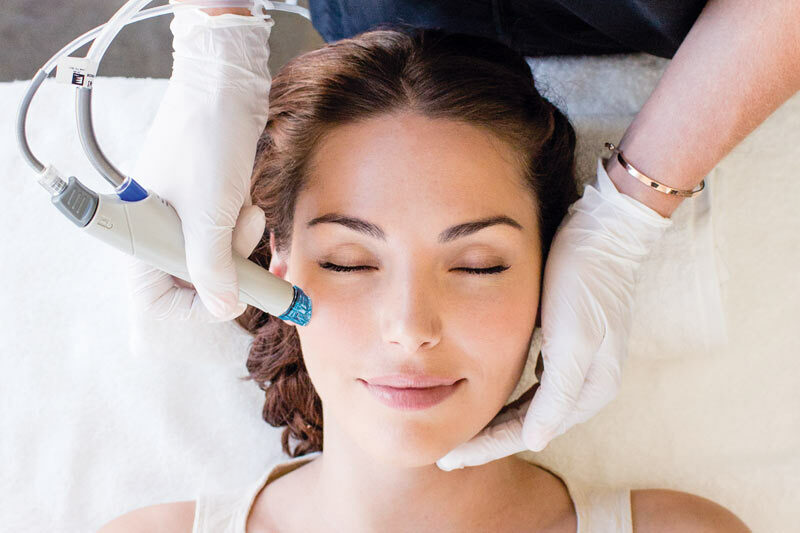 In fact, HydraFacial’s vacuum tip is able to remove skin debris and extract clogged pores without any redness or irritation. It’s also suitable for acne and sensitive skin. Chemical peels use free acid to remove dead skin cells and reduce the appearance of fine lines, age spots, freckles, and acne. They can range from superficial to deep penetration depending on the type and percentage of acid. Although peels can be quite versatile in their capabilities, they are often most effective for patients with fair complexions. HydraFacial, on the other hand, benefits all skin types, and is safe for individuals with skin conditions like rosacea and eczema. Microneedling is also known as collagen induction therapy. During this non-surgical procedure, a manual or automated device glides over the face and punctures the skin with small needles. These microinjuries then stimulate the growth of collagen and elastin. As a result, microneedling can improve tone and texture, hyperpigmentation, acne scars, and stretch marks. However, it can also cause infection and scarring if the newly created microchannels do not heal properly. Some patients, especially those with an aversion to needles, may find the treatment uncomfortable or painful. Alternatively, HydraFacial is completely non-invasive and does not pose any risks for infection or scarring. Patients can return to work and other activities immediately after treatment and note almost instant results. Best of all, HydraFacial does not cause any discomfort and is even tolerable for those with a low threshold for pain. Intense pulsed light (IPL) operates at specific wavelengths and emits a broadband light to target hyperpigmentation and redness in the skin. It’s a quick procedure and can be used on patients with rosacea and sensitive skin. However, IPL’s effectiveness is limited to superficial discoloration, and it cannot penetrate deep enough to improve wrinkles and scarring. Additionally, the treatment’s focus on excess melanin can predispose individuals with darker skin tones to burns and scarring. Therefore, IPL is not recommended for all skin types. Not only can HydraFacial treat patients with rosacea, sensitive skin, and darker skin tones, it’s also able to minimize wrinkles, reduce the appearance of scars, and tighten and lift skin. All of these benefits are possible with a 20 to 30-minute treatment, and patients do not experience any redness, swelling, or irritation. For additional information about HydraFacial benefits and other cosmetic treatments, please call Hagerstown Dermatology & Skincare today to schedule an appointment.